← Laser Therapy – drug & surgery free treatment for your pet! Mr. Echo enjoying the scent of natural organic lavender. Lavender is a common herbal therapy ingredient and is also used in essential oils. It has a natural calming effect. Herbal Therapy is the use of natural plants or plant extracts as medicine. Herbal therapy have been used since ancient times as effective treatment for many conditions. Herbal therapy can be eaten or ingested in the form of capsules or teapills and can also be applied topically on the skin as a salve or poultice as treatment. Herbal medicine utilizes natural herbal ingredients in particular combinations or formulas to treat particular disease patterns. Herbal supplements contain plant based ingredients that have therapeutic properties. Herbs can act as natural and safe pain relievers, cough suppressants , immune boosters and much more! Our doctor uses both chinese herbal remedies as well as traditional western herbs in treating pets. Essential Oils are naturally occuring aromatic compounds that give a plant its distinctive aroma or scent. They also contain compounds that keep the plant healthy and protect it from diseases and insects. Essential Oils are found in the seeds, bark, stems, roots, flowers, and other parts of plants. Besides being fragrant, essential oils can be used for many health benefits and contain anti-anxiety, anti-inflammatory and immune boosting qualities. They are also effective for natural flea control remedies. Our doctor is a fan of lavender essential oils used for its calming properties. We love to use lavender topically prior to an acupuncture treatment and also in our exam room diffusers to help keep pets calm during their evaluation and treatment. How safe is Herbal Therapy and Esential Oils? Herbal Therapy is very safe when administered by a qualified practitioner. Using the right herbs or essential oils in the correct amounts can be very effective for various conditions and can replace traditional medications. Although they are very safe, we do not recommend dosing your pet on your own without guidance. Some essential oils such as oregano are very effective, but may be toxic when used in the wrong way. Please never give an essential oil or herb to your pet without a doctor’s recommendation. What conditions are Herbal Therapy and Essential Oils used for? Herbal Therapy and Essential oils can be used for almost any condition. These include anything from Musculoskeletal conditions (hip dysplasia, elbow dysplasia, arthritis, intervertebral disk disease, etc), to Allergies (skin rashes, dermatitis, ear infections). We have successfully used them for Neurological disorders (siezures, nerve paralysis), Gastrointestinal disorders (diarrhea, vomiting, colic, constipation), Respiratory conditions (cough, asthma) and many Chronic conditions (cushing’s, hypo or hyper thyroidism, diabetes and kidney failure). 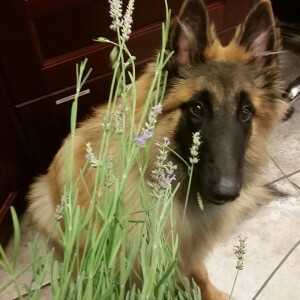 Herbal Therapy is a useful alternative to keeping your pet on chronic pain medications or for pets that cannot tolerate traditional medications due to side effects. It can also be used in conjunction with traditional medication as well as acupuncture and laser therapy for maximum benefit. 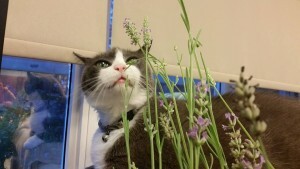 Here is Gary also enjoying the scent of natural organic lavender. Lavender can be used for cats, dogs, bunnies and other pets for its natural calming effect. If you are interested in what herbal therapy or essential oils may be useful for your pet please contact us to schedule an appointment. If you have any other questions please give us a call or send us an email!